Anthem: "We are Ninja, Not Geisha"
The Kansai Republic is a nation state to the west of Japan, occupying western Honshu, Kyushu, and Shikoku. The Yamato, the original descendants of the modern Japanese, originated from Nara in Kansai. They told everyone this so that they could annoy the Tokyoites. Because of this, Kansai was the centre of Japan for most of its existence. The first time the capital moved from Kansai to a location within the currently Japanese terriotires was in 1600-ish precisely, when the Tokugawa Shogunate committed treason in Kansai by secretly saying that he didn't actually like takoyaki very much, and was banished to Edo, now Tokyo. Secession of the Kansai Republic. On August 16, 2013, Osaka Prefecture announced to the rest of Japan that it would declare independence if it was not made the capital city. This was refused, and Osaka then declared independence (relatively) peacefully. 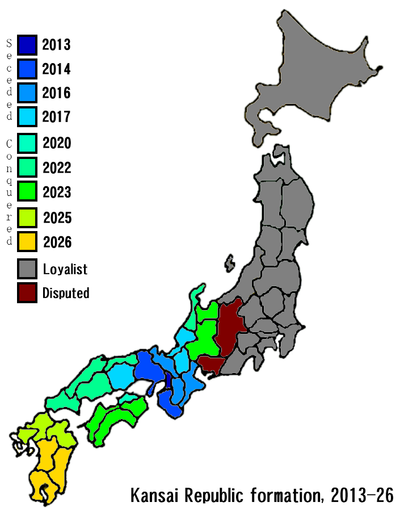 In early 2014, the governor of Hyogo (Kobe) Prefecture announced that Hyogo would be joining Osaka in secession in pursuit of a Kansai nation. This was followed soon after by Wakayama, thus making Kansai the subject of most whaling protests rather than loyalist Japan. This continued until July 16 in Kyoto, the day of the Gozan Okuribi (translated as "that's a damn big kanji on that mountain") festival, when Kyoto decided it would also secede from Japan. Kyoto was followed closely by Nara and Mie prefectures, thus ensuring that all of the important temples (and half the Japanese tourist trade) enter Kansai. The following year, the surrounding prefectures of Shiga, Okayama, and Fukui seceded, and thus the entirety of geographic Kansai. This remained in stasis for three years until Osaka scientists perfected the Proximity Takoyaki Mine, a devious piscine weapon if there ever was one. Immediately, Kansai started to gain territory by the week. By the end of the year, a quarter of Shikoku Island was under Kansai control. In 2022, Kansai launched another offensive which succeeded in capturing the entirety of western Honshu, including, crucially, Hiroshima, which still exists (This comes as a surprise to most people, who think Tokyo doesn't exist either), and Shimonoseki, home to the fugu trade in Japan and therefore to the ninja poisoning arts. In the same year, they also captured Ishikawa in central Honshu. The offensive here continued into 2023, when Gifu and Toyama were captured, and also the rest of Shikoku island. By 2026, Kyushu Island had also been annexed, and Kansai as we know it today was formed. The Kansai Republic strives to be as culturally different to loyalist Japan as possible. Therefore, they do not import any culture from the loyalist territories. Instead, Kansaijin work hard to create their own culture. However, this varies hugely depending on the part of the country the Kansai tourist is visiting. In the political and almost-everything-else capital of Kansai, Osaka, culture is widely based on the two pillars of food and hypertechnology, usually taking the form of takoyaki (which have almost become a sport in themselves) and electric toilets (ditto). Hiroshima and Nagasaki focus on not mentioning the war, whereas southern Kyushu is more oriented towards volcanoes, particularly in Kagoshima, where volcanic ash is treated as "rain" and the lava powers half of the island. A typical breakfast in Kyoto. Sport in Kansai generally revolves around one of their main points they use to boast to loyalist Japan: that Kansai have Nintendo. Therefore, Kyoto is split into two parts: ancient Kyoto, with all of the temples and shrines that are a key feature of the city and make up half of the Kansai Republic's tourist trade, and modern Kyoto, where Nintendo have grown in influence so much that most tasks are executed using a Wii. In other parts of the country, however, Osaka dominates, and with Osaka comes Capcom, whose most-loved Kansai product is Monster Hunter, which replicates daily life in loyalist Japan due to its kaiju. Outside of Nintendo and Capcom, Shodokan Aikido (a sport version of the martial art Aikido) is also based in Osaka, and is part of the the reason why Kansai generally wins most battles not involving opposing Aikido practitioners from Tokyo. Some Kansaijin are also fanatical about baseball, which explains why some Osakan supporters, as an act of celebration, threw a statue of Colonel Sanders into the Dotonbori river. One final sport worth mentioning, popular among people who want to commit suicide along with yakuza, is fugushini, a version of Russian roulette but instead of the gun there is a plate of blowfish sashimi, where one of the pieces has been prepared incorrectly and thus contains a deadly poison. The Kansai Republic joined the United Nations in 2017, although it is rumoured the decision was biased towards Kansai as the UN need a constant supply of takoyaki to run efficiently. Most UN members now accept Kansai as an independent nation. The only major exception is China, as it has gotten into the habit of not recognising any nation and declaring itself the ruler of the entire planet. Japan-Kansai relations have always been strained, and some of central Japan is still disputed between the two nations, notably Nagoya, which is currently under Japanese rule but generally fluctuates every 6.283 days exactly. Surprisingly, unlike most Japanese disputes, fish do not play a huge role, as both Japan and Kansai have major fish ports. This page was last edited on 28 September 2012, at 08:24.